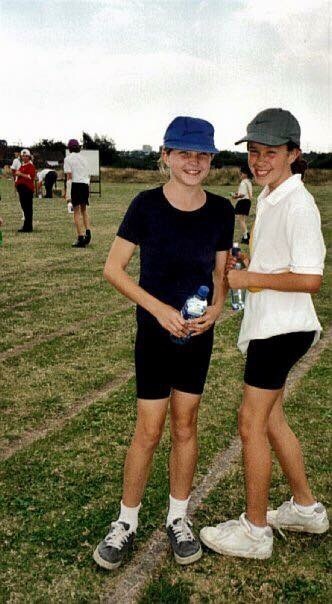 People blame the media for young girls having problems with how they look and striving to be skinny and to some extent I do agree but I had issues with my body at a young age and as far as I can remember, it wasn’t brought about by the media. I grew up in a time before smartphones and constant access to celebrity gossip. The photo below was taken when I was around 10 years old. Even now I look at it, as a (semi-sensible) adult, I feel a little twinge that I can’t look slim like that anymore. But I know the truth behind that photo and it reminds me that being healthy is more important. I went through a phase of throwing my lunches away. I would eat maybe one thing from my lunch and chuck the rest of it in the bin. My mum was none the wiser. Worryingly it came at the same time that I got into running and entered the town sports. I was burning energy but not eating anywhere near enough food to keep me going. My relationship with food isn’t perfect these days, but having children and going through pregnancies has definitely helped me to be more sensible. I want my children to grow up and feel happy and confident in their own bodies and hope that having experienced issues in the past, I am able to help them for the future.